So hey, I actually participated in this year’s Hourly Comic Day, which was on Friday, February 1st. I’m only a few days late in actually posting the comics… and I might have bent the rules a few other places too. Sorry about that (if you’re unfamiliar with the concept, here are some simple guidelines that explain Hourly Comic Day). Nevertheless, I’m pretty proud that I managed to finish these, simply because I’ve never documented a day in comics before. In hindsight, I see that my panels are wonky and pretty horrendous. I should’ve known better than to freehand them… And of course using a ruler didn’t help when it was wonky in the first place. I could’ve used a template or skipped the borders on the original drawings and added them later in the process. Now I know! 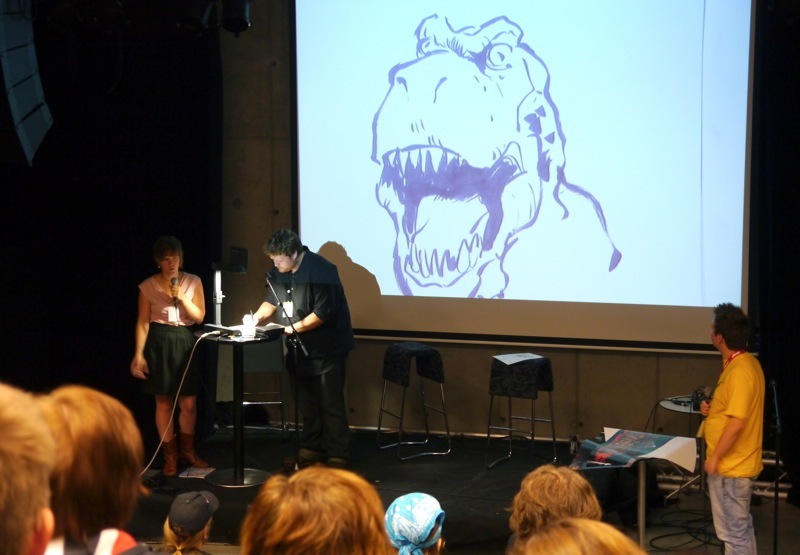 It was very fun to feel that I’m a part of something much bigger. I tried my best to keep up with the updates from all the creative people I follow on Twitter, but it became increasingly difficult. I ended up spending Saturday morning scrolling through a lot of hourlies. Also, feel free to leave a comment if you like. The comment section is open for constructive critisism as well. Or perhaps you would like to share a link to your Hourly Comics ? I would definitely check them out! Like many others, I’ve got a certain fascination for Studio Ghibli. 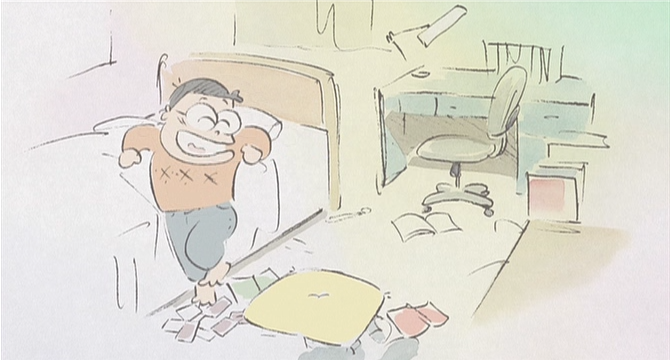 The animation studio’s somewhat abstract and experimental movie Iblard Jikan is certainly not their most popular and mainstream movie, but it’s definitely a work of movie magic that is a peculiar experience to watch. Created by Ghibli in 2009 Iblard Jikan (translated to “Iblard Chronicles” in English) is both a wonderful and slightly weird movie. One might say that it’s wonderfully weird at times. In addition, it’s an extremely fascinating show of creativity. 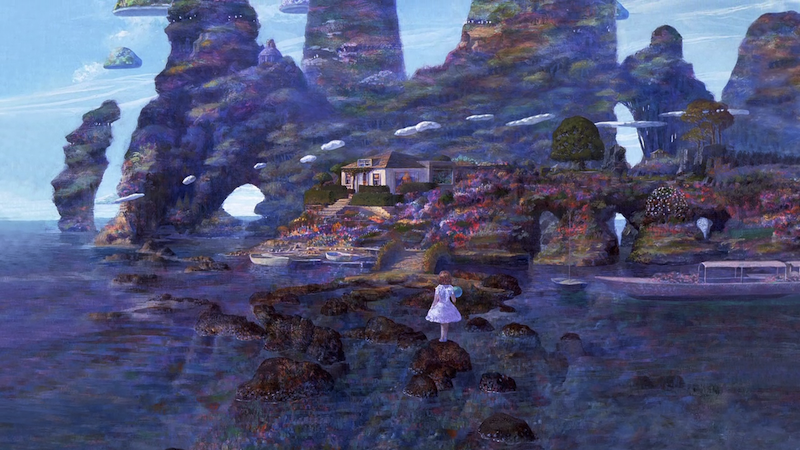 Every scene is like a highly impressionistic oil painting, with various bits and pieces being “alive”. 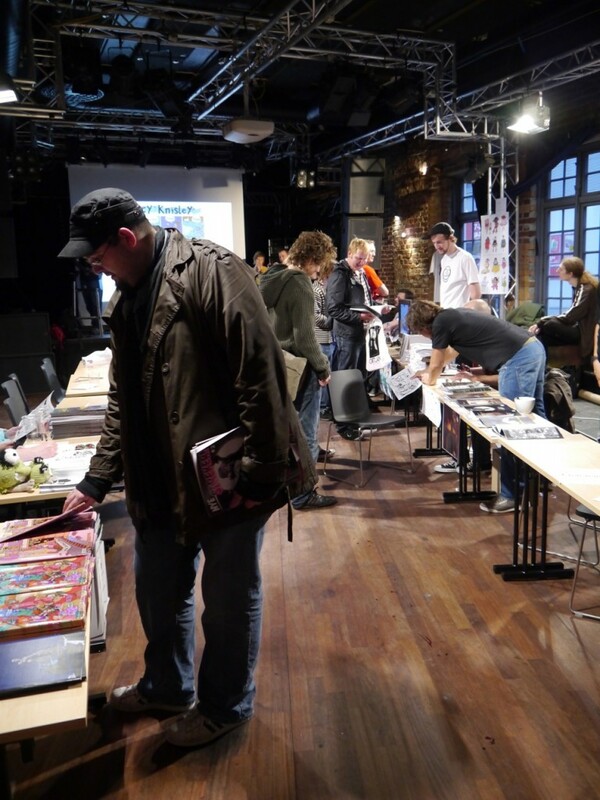 Naohisa Inoue is the artist behind the paintings, and he is also the creator behind the fantasy world of Iblard (イバラード). 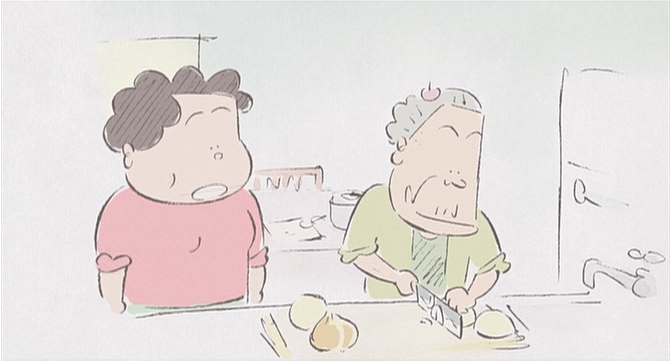 In the movie, elements of various degrees of simplicity, like people and vehicles, are animated and added into the scene. Sometimes they freeze into the painting-like style, or jump out of the painting, drawing the viewers attention. At one time, one of the characters breaks the fourth wall and “looks” directly at the viewer. Also, it seems like the aforementioned degree of weirdness increases according to how far into the movie you get. Suddenly there are floating and flying people, miniature planets hovering about and giant, Zeppelin-like balloons that grow from plants like fruits. Iblard Jikan has been called an experiment in artistic skill that shows what Studio Ghibli is capable of producing. It’s only 30 minutes long, but serves as a large portfolio of different effects and animation techniques. To me, that’s one aspect of what’s interesting about this movie. 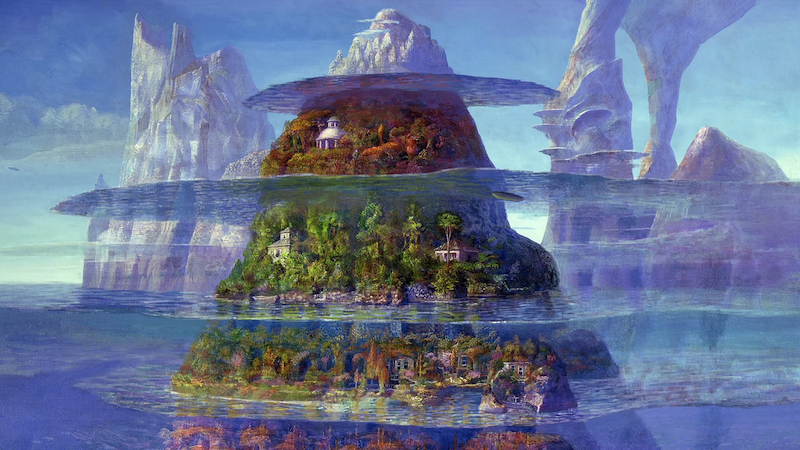 The other is that by creating something like this, Studio Ghibli has made fantasy artist Naohisa Inoue’s world, which exists in his paintings, come alive to an even larger extent in the viewer’s imagination. The visuals spark ideas and stories, and make the watching experience even more real. You simply accept that in such a world, things like this and that exist, and it doesn’t have to be a reason for it to do so. I find myself getting lost while looking in awe at the details in every scene, letting myself get tricked into believing that things that are not there, really exist. Because if you look at it with from a realistic viewpoint, it’s all just carefully assembled dots and strokes of paint. And that’s no fun. The music and sound design works very well with the movie, providing a fitting atmosphere that suits the scenery, mood, occasional people and movements on the screen. The movie is divided into 8 segments, each with its own musical piece. The music consists of mainly instrumentals with sporadic voices, increasing in intensity accordingly to… yep, you guessed it – that lovely weirdness I’ve mentioned a few times by now. Just as a side note; my favorites among the sound effects has to be the sound of old, rattling traincars through rainy weather. Certainly, it’s not all good. I’ve got a habit of nitpicking, and there are a couple of things I would have liked better if done differently. Just to give a neat and quick review of Iblard Jikan, here are some good and some bad things that I’d like to point out. 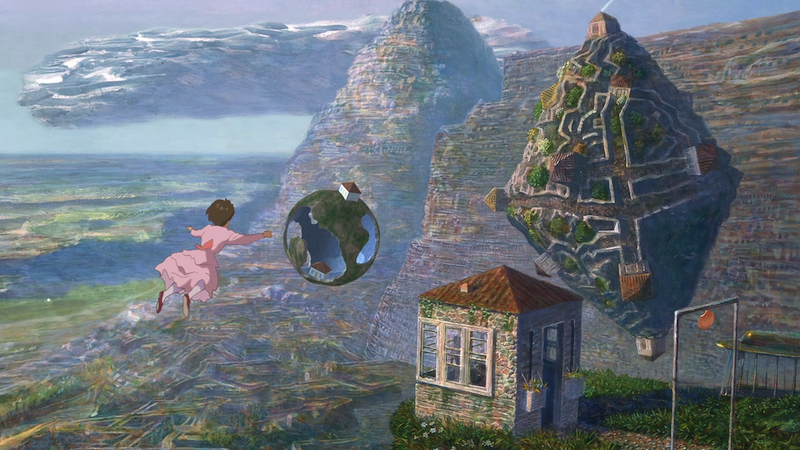 The good: Watching this short movie is like taking a peek into another world or dimension, one which is saturated with imagination and color. The fact that there’s no real storyline, makes the viewer think for himself. What’s the story behind this place? How do the people in this world live their lives? The music works beautifully and adds feeling and good pacing to the different segments. The bad: Sometimes the 3D-generated elements stand out too much. For example, some of the vehicles look very much out of place. The movie is also a bit on the short side. I would’ve liked to see more of this fantasy world. Also, people who’re not fond of surrealism might not like Iblard Jikan due to all of the weird things that happen. Finally, if you’ve watched this movie, or I’ve somehow managed to make you want to watch it sometime, I’m very interested in hearing your thoughts. Maybe you totally disagree with me, and think it was uninspired and not interesting at all. You’ve read my review this far, now let me hear your opinion. Oh yeah, one last note. If you’re an artist, or you’re just interested in how Naohisa Inoue’s works, there’s a pretty neat step-by-step article on iblard.com that shows his painting process. The website looks kinda old (notice the “copyright 2003” stamp), but there seems to be a lot of good content available. Or, if you’re capable of reading Japanese, you could check out Naohisa’s personal blog, which is a lot more up to date! 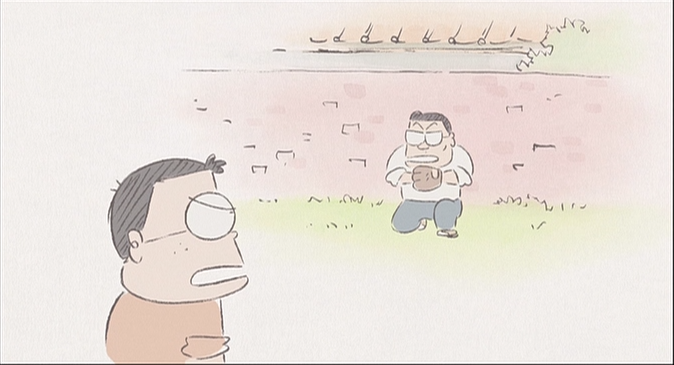 PS: If you liked this review, you might also want to check out Thoughts on “My Neighbors The Yamadas“. 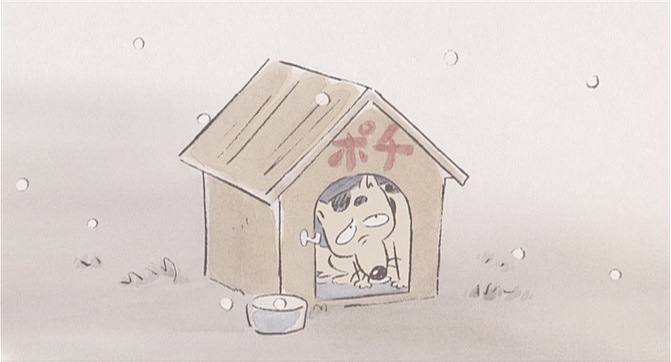 … and there’s also this dog, although he doesn’t show up much. My Neighbors the Yamadas (with the Japanese title “Hôhokekyo tonari no Yamada-kun”), was released in 1999, and was Studio Ghibli’s first 100% digitally produced animation movie. But at first glance, you wouldn’t think it was made digitally. 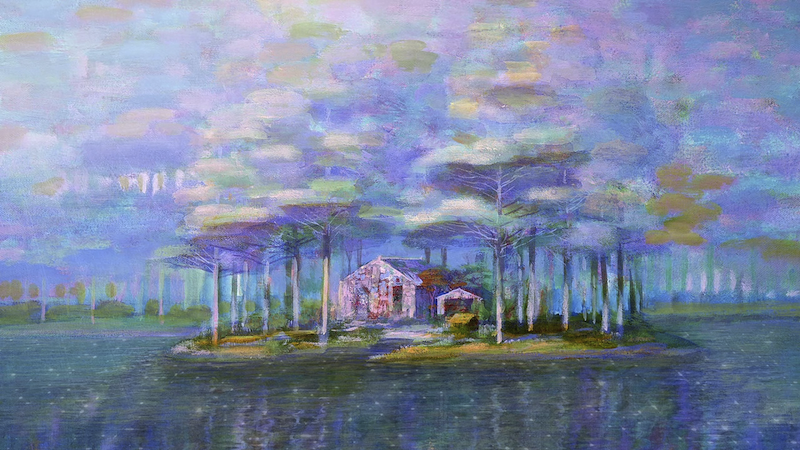 It has been described as watching a watercolor painting coming to life, the light colors sometimes spilling outside of the sketchy outlines and with simplistic backgrounds and environments. The style is distinctly different from what Ghibli had made up to that point in time, some examples being Nausicaa of the Valley of the Wind, Whisper of the Heart, Kiki’s Delivery Service and the highly popular movie with the similar title, My Neighbor Totoro. 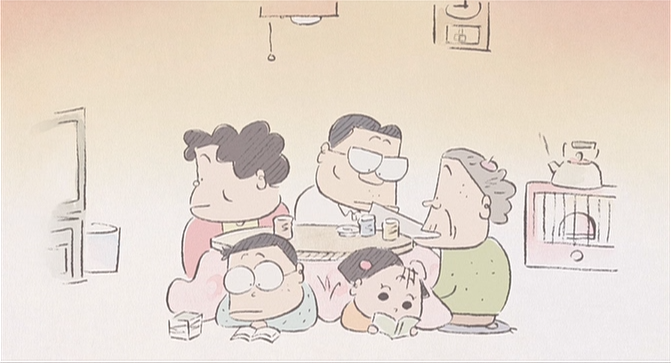 However, My Neighbors the Yamadas’ style works incredibly well with the “slice of life” genre of the movie. It is is based on a four panel comic called Nono-chan by Hisaichi Ishii, and typical for the gag-type comic, there’s in fact no main storyline. 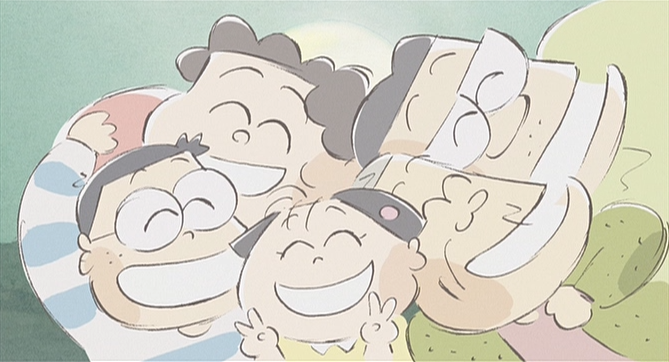 Instead, there are a lot of segments varying in length, sometimes preceded by a title topic like “Marriage, Yamada style” and “Father and son bonding”. Through these segments we get to know the strict, but loving father; the stubborn and sometimes lazy and forgetful mother; the teenaged son who’s studying hard, and the independent and energetic little sister. The 70-year old grandmother also plays an important role in the three generations household, being the eldest and supposedly the wisest. Some of the themes presented are household duties, the relationship between husband and wife, the responsibility of the head of the family and the troubles of a hard-working student. Additionally, there are some treats for those who like japanese poetry as well. Some of the segments have haiku’s being read aloud at the end, giving them a nice level of philosophical depth. The soundtrack is usually light and playful, but it will occasionally turn very gloomy to add the necessary melancholy to the scene. Nonetheless, this is first and foremost a feel good movie, and the cheery piano and vocal music reflects that very well. Although the daily life of the family is highly caricatured, there are a few interesting things to learn about Japanese culture and society. Having studied said topics (and some Japanese) certainly helps when trying to decode some of the humor and understanding certain jokes, but I think it’s certainly possible for everyone to enjoy and even learn from the many different episodes. Moreover, there are a multitude of delightful dialogues between the characters. Sadly, some of the nuances are not represented well enough in the translated english subtitles (in this case, the DVD version from Optimum Releasing). My conclusion is; watch this movie, especially if you’re a student of Japanese or even the slightest interested in Japan. 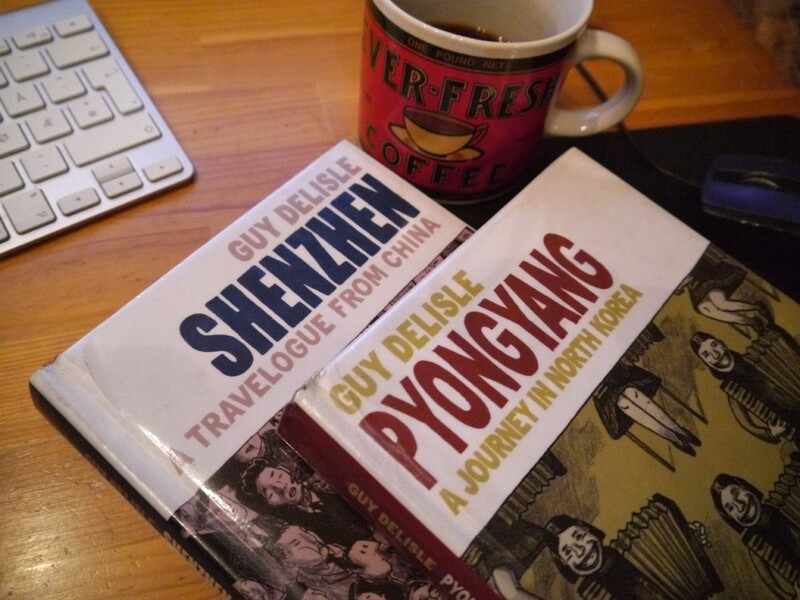 I finished reading Guy Delisle’s travelogue from his year in Burma (Myanmar). 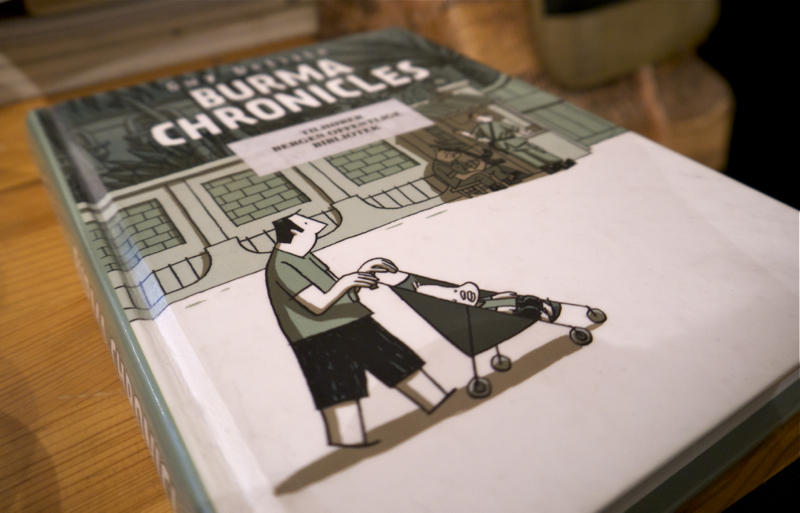 The book is called “Burma Chronicles” (2008) and is the third book in the familiar, cartoony style of Delisle’s travelogues. If you’re interested in checking them out, you might want to read my review of the first two books. I have to say that I’ve been thoroughly enjoying Guy Delisle’s delightful observations. First of all, this book is an educational trip into how the situation in Burma was a couple of years ago. Secondly, there are a lot of comical situations and descriptions of the daily life of a small family (Delisle, his wife Nadége, and their baby, Louis) in a tropical country. For example, a power outage becomes a very specific problem when you’re not used to the blistering heat, and rely fully on air-conditioning to keep cool. The book is loosely partitioned into sections, with the upper left panel of a section bearing a title and an illustration of something related to the story. I like this way of telling the story in episodes, and still keeping it more or less chronological from start to finish. 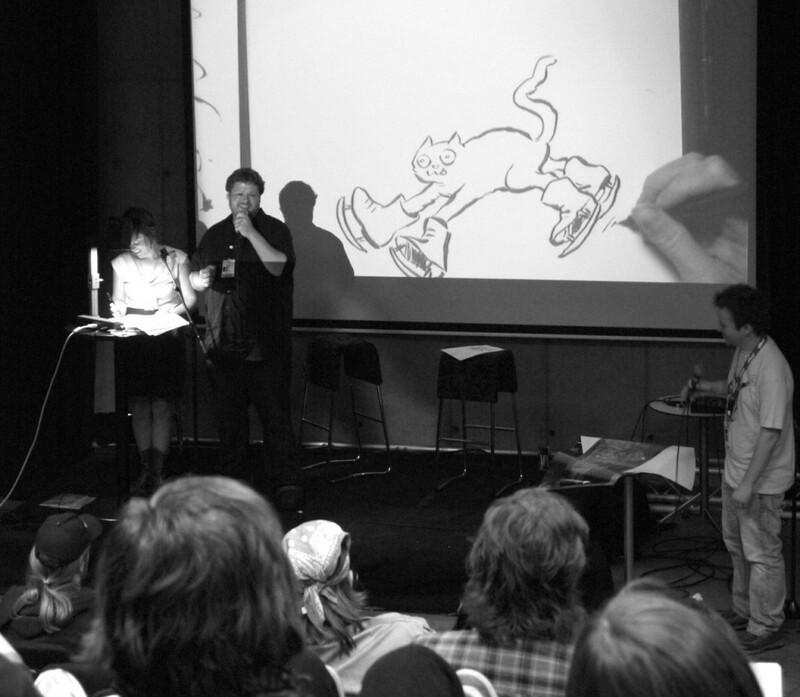 Delisle is nonetheless a master at using the possibilities of telling a story in comic form. During a side-story where he finds a long lost pen nib in his inkwell, we see him peering over the shoulder of a younger version of himself in a flashback. He then proceeds to loudly criticize the work he was working on at the time. His younger self retorts with a very fitting “Screw you. I can do whatever I like”. A big topic which gets revisited several times is non-profit organizations, among them Médecins Sans Frontières (Doctors Without Borders). It is also made clear that NPO’s like Médecins Sans Frontières are very much needed, as the health care system in Burma is one of the worst in the world. Delisle’s wife, Nadége, is a part of MSF. Delisle himself is given a chance to join her on a mission, and his account of the trip gives an insight in exactly how the MSF worked to help the population in rural areas of Burma. This episode also involves extremely uncomfortable bus rides, and an unfortunate incident of stomach sickness. Just to mention a few of the not-so-great experiences he has included in the book.